It’s time for another mystery! Here’s an antique spinning (or flax?) wheel that I acquired recently and would love to learn more about. She came to me with no history, no known provenance, just the admiration of a whole crowd of people who wondered who was going to take her home. Turns out it was me. Today I asked the members of Ravelry.com if they had any ideas, and was met with requests for more photos. And so here they are, more photos of the little gal in all her aged-wood patina glory, sitting pretty in the sunshine. There are obvious repairs in several places, but she has been oiled up and her movement is very smooth and pleasant. If you have any information, suggestions, words of wisdom, etc., I welcome your input. Getting back to things I’m more familiar with, there are six new thread colors from Olympus that have all the punch and verve you want for spring and summer projects. While I’m more of a traditionalist (Indigo! make everything indigo!! 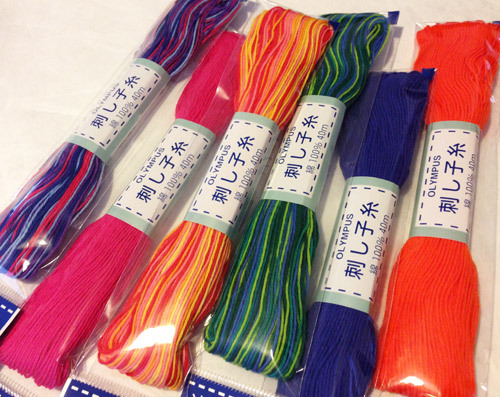 ), you might appreciate these eye-popping solid color and variegated 40 meter skeins, especially for the pre-printed kits. New colors from Olympus Sashiko! I’ll be placing an order for more sashiko thread very soon, so if you’re interested in these colors, please let me know and I’ll order accordingly. Previous Post Guess What Just Happened?